Sound less then excited in my title? That is because I was. I have the original Pebble, the Pebble Steel and the original LG. The Apple watch is nicer then all of these, but only just a bit nicer. The screen is a bit nicer, but not much. 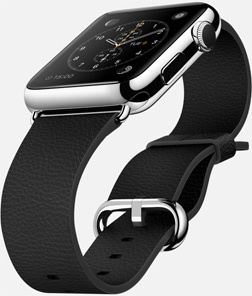 I liked the round edges of the watch, but it still looked too big to me. The band was nice too, but I like the leather on the Steel better. The OS was good as well. There are little things I really like that Apple has done, and I’m sure the rest of the watch makers, sans Pebble, will integrate some of these features in future updates. (Although Siri could be better.) But what was missing was the wow factor. And that is because Apple is late with something that is better, but not a quantum leap better than what we have now. I’m not disappointed with the Apple watch, I want to be clear about that. Its still beautiful and clearly the high water mark for what a smart-watch can be, but its not enough to make me go back to an Apple phone. And that is to my mind the mark of a great device.. Something that is so good, I’m willing to switch phones for it.